I love split cassettes and have often wondered whether the two artists doing the split should be similar or different—basically where that line should be drawn. 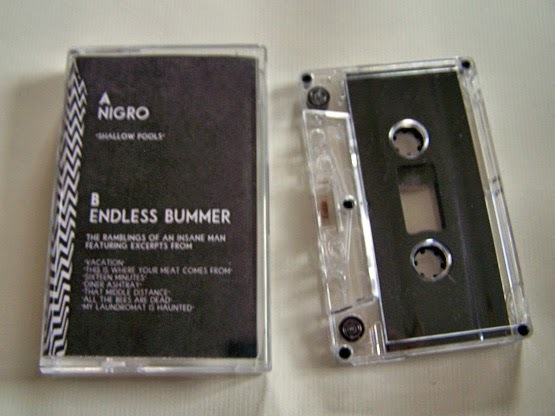 With this particular cassette, I can’t help but find myself listening to it and thinking about how Nigro and Endless Bummer are different, yet the same, based on each particular side. 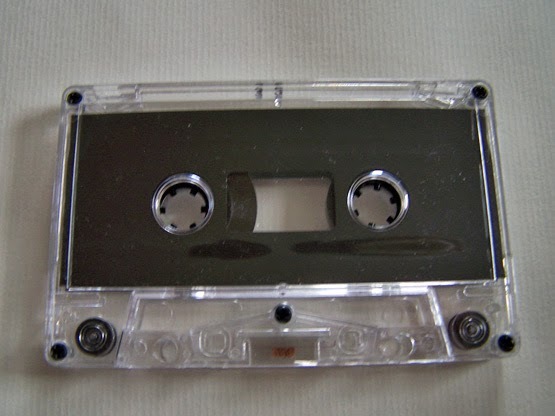 I guess what I’m trying to say is that I usually see each side as its own entity, yet with this cassette I am seeing them being more closely intertwined. 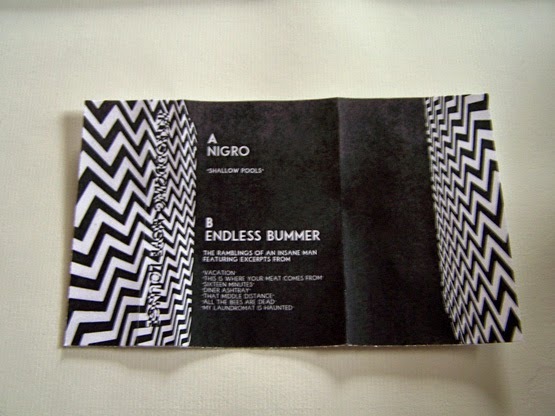 I’m going to flip things and begin with Endless Bummer because on Side B, there is seemingly a bit of structure and it is patterned as other pieces of music of this nature often seem to be. There are audio clips about the Vietnam War throughout, and the style can go from this heavy, industrial type of synth noise to the triumphant sound and finally a western movie feel. In that regard, it feels like it has three movements all brought together by this audio clip. Nigro, who has Side A, is not quite as structured, which is not a bad thing because structure has never made or broken music for me. 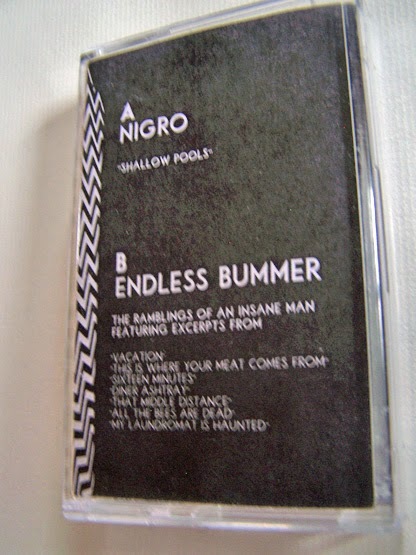 The distorted noise of Nigro is loud, yes, but not in the way that Endless Bummer is loud on that instrumental Nine Inch Nails level. Nigro has laser beeps in his song, and it is very spatial. It verges on being the soundtrack to a video game more often than not, however it seems as if every time it gets close enough to become a video game soundtrack it pulls itself back so as to never truly be one. What I find most intriguing about this cassette is that on its very basic level, it sounds as if it could be the same song from both artists only presented in their own take on it. I know this is not true, but as much as Nigro and Endless Bummer seem to contrast each other, they also seem to be similar. It is that ancient finger trap for sure, as the two artists are seemingly engaged in a rivalry against each other in terms of style, yet somehow also remain the closest of friends.